In the course of the foregoing chapter we left David in triumph; now in this chapter we have, I. The improvement of his triumphs; he soon became, 1. Saul's constant attendant, ver. 2. 2. Jonathan's covenant friend, ver. 1, 3, 4. 3. The darling of his country, ver. 5, 7, 16. II. The allays of his triumphs. This is the vanity that accompanies even a right work, that "for it a man is envied," Eccl. iv. 4. So David was by Saul. 1. He hated him, and sought to kill him himself, ver. 8-11. 2. He feared him, and contrived how he might have some mischief done him, ver. 12-17. He proposed to marry his daughter to him; but, [1.] cheated him of the eldest to provoke him (ver. 19), and, [2.] Gave him the younger, upon conditions which would endanger his life, ver. 20-25. But David performed his conditions bravely (ver. 26, 27), and grew to be more and more esteemed, ver. 28-30. Still David is rising, but (as all that aim at the crown of life must expect) he had a great deal of difficulty and opposition to grapple with. 1 And it came to pass, when he had made an end of speaking unto Saul, that the soul of Jonathan was knit with the soul of David, and Jonathan loved him as his own soul. 2 And Saul took him that day, and would let him go no more home to his father's house. 3 Then Jonathan and David made a covenant, because he loved him as his own soul. 4 And Jonathan stripped himself of the robe that was upon him, and gave it to David, and his garments, even to his sword, and to his bow, and to his girdle. 5 And David went out whithersoever Saul sent him, and behaved himself wisely: and Saul set him over the men of war, and he was accepted in the sight of all the people, and also in the sight of Saul's servants. I. That Saul, who was now in possession of the crown, reposed a confidence in him, God so ordering it, that he might by his preferment at court be prepared for future service. Saul now took David home with him, and would not suffer him to return again to his retirement, v. 2. And David having signalized himself above the men of war, in taking up the challenge which they declined, Saul set him over the men of war (v. 5), not that he made him general (Abner was in that post), but perhaps captain of the life-guard; or, though he was youngest, he ordered him to have the precedency, in recompence of his great services. He employed him in the affairs of government; and David went out whithersoever Saul sent him, showing himself as dutiful as he was bold and courageous. Those that hope to rule must first learn to obey. He had approved himself a dutiful son to Jesse his father, and now a dutiful servant to Saul his master; those that are good in one relation it is to be hoped will be so in another. II. That Jonathan, who was heir to the crown, entered into covenant with him, God so ordering it, that David's way might be the clearer when his rival was his friend. 1. Jonathan conceived an extraordinary kindness and affection for him (v. 1): When he had made an end of speaking to Saul he fell perfectly in love with him. Whether it refers to his conference with Saul before the battle (ch. xvii. 34, 37), or to that after (v. 51), in which it is probable much more was said than is there set down, is uncertain. But, in both, David expressed himself with so much prudence, modesty, and piety, such a felicity of expression, with so much boldness and yet so much sweetness, and all this so natural and unaffected, and the more surprising because of the disadvantages of his education and appearance, that the soul of Jonathan was immediately knit unto the soul of David. 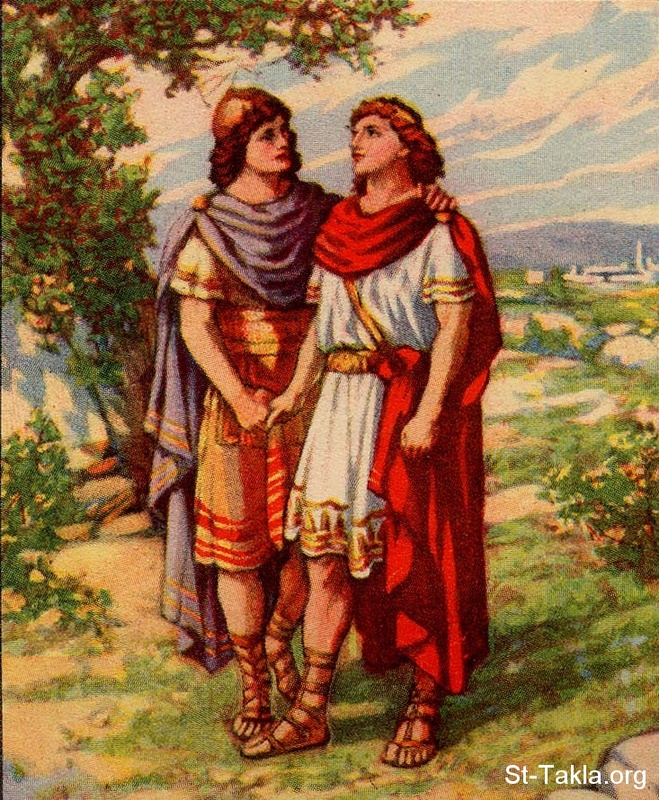 Jonathan had formerly set upon a Philistine army with the same faith and bravery with which David had now attacked a Philistine giant; so that there was between them a very near resemblance of affections, dispositions, and counsels, which made their spirits unite so easily, so quickly, so closely, that they seemed but as one soul in two bodies. None had so much reason to dislike David as Jonathan had, because he was to put him by the crown, yet none regards him more. Those that are governed in their love by principles of wisdom and grace will not suffer their affections to be alienated by any secular regards or considerations: the greater thoughts will swallow up and overrule the less. 2. He testified his love to David by a generous present he made him, v. 4. He was uneasy at seeing so great a soul, though lodged in so fair a body, yet disguised in the mean and despicable dress of a poor shepherd, and therefore takes care to put him speedily into the habit of a courtier (for he gave him a robe) and of a soldier, for he gave him, instead of his staff and sling, a sword and bow, and, instead of his shepherd's scrip, a girdle, either a belt or a sash; and, which made the present much more obliging, they were the same that he himself had worn, and (as a presage of what would follow) he stripped himself of them to dress David in them. Saul's would not fit him, but Jonathan's did. Their bodies were of a size, a circumstance which well agreed with the suitableness of their minds. When Saul put these marks of honour on David he put them off again, because he would first earn them and then wear them; but, now that he had given proofs of the spirit of a prince and a soldier, he was not ashamed to wear the habits of a prince and a soldier. David is seen in Jonathan's clothes, that all may take notice he is a Jonathan's second self. Our Lord Jesus has thus shown his love to us, that he stripped himself to clothe us, emptied himself to enrich us; nay, he did more than Jonathan, he clothed himself with our rags, whereas Jonathan did not put on David's. 3. He endeavored to perpetuate this friendship. So entirely satisfied were they in each other, even at the first interview, that they made a covenant with each other, v. 3. Their mutual affection was sincere; and he that bears an honest mind startles not at assurances. True love desires to be constant. Those who love Christ as their own souls will be willing to join themselves to him in an everlasting covenant. III. That both court and country agree to bless him. It is but seldom that they agree in their favourites; yet David was accepted in the sight of all the people, and also (which was strange) in the sight of Saul's servants, v. 5. The former cordially loved him, the latter could not for shame but caress and compliment him. And it was certainly a great instance of the power of God's grace in David that he was able to bear all this respect and honour flowing in upon him on a sudden without being lifted up above measure. Those that climb so fast have need of good heads and good hearts. It is more difficult to know how to abound than how to be abased. 6 And it came to pass as they came, when David was returned from the slaughter of the Philistine, that the women came out of all cities of Israel, singing and dancing, to meet king Saul, with tabrets, with joy, and with instruments of music. 7 And the women answered one another as they played, and said, Saul hath slain his thousands, and David his ten thousands. 8 And Saul was very wroth, and the saying displeased him; and he said, They have ascribed unto David ten thousands, and to me they have ascribed but thousands: and what can he have more but the kingdom? 9 And Saul eyed David from that day and forward. 10 And it came to pass on the morrow, that the evil spirit from God came upon Saul, and he prophesied in the midst of the house: and David played with his hand, as at other times: and there was a javelin in Saul's hand. 11 And Saul cast the javelin; for he said, I will smite David even to the wall with it. And David avoided out of his presence twice. Now begin David's troubles, and they not only tread on the heels of his triumphs, but take rise from them, such is the vanity of that in this world which seems greatest. I. He was too much magnified by the common people. Some time after the victory Saul went a triumphant progress through the cities of Israel that lay next him, to receive the congratulations of the country. And, when he made his public entry into any place, the women were most forward to show him respect, as was usual then in public triumphs (v. 6), and they had got a song, it seems, which they sang in their dances (made by some poet or other, that was a great admirer of David's bravery, and was more just than wise, in giving his achievements in the late action the preference before Saul's), the burden of which was, Saul had slain his thousands, and David his ten thousands. Such a difference as this Moses made between the numbers of Ephraim and Manasseh, Deut. xxxiii. 17. II. This mightily displeased Saul, and made him envy David, v. 8, 9. He ought to have considered that they referred only to this late action, and intended not to diminish any of Saul's former exploits; and that in the action now celebrated it was undeniably true that David, in killing Goliath, did in effect slay all the Philistines that were slain that day and defeated the whole army; so that they did but give David his due. It may be, he that composed the song only used a poetic liberty, and intended not any invidious comparison between Saul and David; or, if he did, it was below the great mind of a prince to take notice of such a reflection upon his personal honour, when it appeared that the glory of the public was sincerely intended. But Saul was very wroth, and presently suspected some treasonable design at the bottom of it: What can he have more but the kingdom? This made him eye David as one he was jealous of and sought advantages against (v. 9): his countenance was not towards him as it had been. Proud men cannot endure to hear any praised but themselves, and think all their honour lost that goes by themselves. It is a sign that the Spirit of God has departed from men if they be peevish in their resentment of affronts, envious and suspicious of all about them, and ill-natured in their conduct; for the wisdom from above makes us quite otherwise. III. In his fury he aimed to kill David, v. 10, 11. Jealousy is the rage of a man; it made Saul outrageous against David and impatient to get him out of the way. 1. His fits of frenzy returned upon him. The very next day after he conceived malice against David the evil spirit from God, that had formerly haunted him, seized him again. Those that indulge themselves in envy and uncharitableness give place to the devil, and prepare for the re-entry of the unclean spirit, with seven others more wicked. Where envy is there is confusion. Saul pretended a religious ecstasy: He prophesied in the midst of the house, that is, he had the gestures and motions of a prophet, and humoured the thing well enough to decoy David into a snare, and that he might be fearless of any danger and off his guard; and perhaps designing, if he could but kill him, to impute it to a divine impulse and to charge it upon the spirit of prophecy with which he seemed to be animated: but really it was a hellish fury that actuated him. 2. David, though advanced to a much higher post of honour, disdained not, for his master's service, to return to his harp: He played with his hand as at other times. Let not the highest think any thing below them whereby they may do good and be serviceable to those they are obliged to. 3. He took this opportunity to aim at the death of David. A sword in a madman's hand is a dangerous thing, especially such a madman as Saul was, that was mad with malice. Yet he had a javelin or dart in his hand, which he projected, endeavouring thereby to slay David, not in a sudden passion, but deliberately: I will smite David to the wall with it, with such a desperate force did he throw it. Justly does David complain of his enemies that they hated him with a cruel hatred, Ps. xxv. 19. No life is thought too precious to be sacrificed to malice. If a grateful sense of the great service David had done to the public could not assuage Saul's fury, yet one would think he should have allowed himself to consider the kindness David was now doing him, in relieving him, as no one else could, against the worst of troubles. Those are possessed with a devilish spirit indeed that render evil for good. Compare David, with his harp in his hand, aiming to serve Saul, and Saul, with his javelin in his hand, aiming to slay David; and observe the meekness and usefulness of God's persecuted people and the brutishness and barbarity of their persecutors. The bloodthirsty hate the upright, but the just seek his soul, Prov. xxix. 10. 4. David happily avoided the blow twice (namely, now, and afterwards, ch. xix. 10); he did not throw the javelin at Saul again, but withdrew, not fighting but flying for his own preservation; though he had both strength and courage enough, and colour of right, to make resistance and revenge the injury, yet he did no more than secure himself, by getting out of the way of it. David, no doubt, had a watchful eye upon Saul's hand, and the javelin in it, and did as bravely in running from it as he did lately in running upon Goliath. Yet his safety must be ascribed to the watchful eye of God's providence upon him, saving his servant from the hurtful sword; and by this narrow escape it seemed he was designed for something extraordinary. 12 And Saul was afraid of David, because the Lord was with him, and was departed from Saul. 13 Therefore Saul removed him from him, and made him his captain over a thousand; and he went out and came in before the people. 14 And David behaved himself wisely in all his ways; and the Lord was with him. 15 Wherefore when Saul saw that he behaved himself very wisely, he was afraid of him. 16 But all Israel and Judah loved David, because he went out and came in before them. 17 And Saul said to David, Behold my elder daughter Merab, her will I give thee to wife: only be thou valiant for me, and fight the Lord's battles. For Saul said, Let not mine hand be upon him, but let the hand of the Philistines be upon him. 18 And David said unto Saul, Who am I? and what is my life, or my father's family in Israel, that I should be son in law to the king? 19 But it came to pass at the time when Merab Saul's daughter should have been given to David, that she was given unto Adriel the Meholathite to wife. 20 And Michal Saul's daughter loved David: and they told Saul, and the thing pleased him. 21 And Saul said, I will give him her, that she may be a snare to him, and that the hand of the Philistines may be against him. Wherefore Saul said to David, Thou shalt this day be my son in law in the one of the twain. 22 And Saul commanded his servants, saying, Commune with David secretly, and say, Behold, the king hath delight in thee, and all his servants love thee: now therefore be the king's son in law. 23 And Saul's servants spake those words in the ears of David. And David said, Seemeth it to you a light thing to be a king's son in law, seeing that I am a poor man, and lightly esteemed? 24 And the servants of Saul told him, saying, On this manner spake David. 25 And Saul said, Thus shall ye say to David, The king desireth not any dowry, but a hundred foreskins of the Philistines, to be avenged of the king's enemies. But Saul thought to make David fall by the hand of the Philistines. 26 And when his servants told David these words, it pleased David well to be the king's son in law: and the days were not expired. 27 Wherefore David arose and went, he and his men, and slew of the Philistines two hundred men; and David brought their foreskins, and they gave them in full tale to the king, that he might be the king's son in law. And Saul gave him Michal his daughter to wife. 28 And Saul saw and knew that the Lord was with David, and that Michal Saul's daughter loved him. 29 And Saul was yet the more afraid of David; and Saul became David's enemy continually. 30 Then the princes of the Philistines went forth: and it came to pass, after they went forth, that David behaved himself more wisely than all the servants of Saul; so that his name was much set by. Saul had now, in effect, proclaimed war with David. He began in open hostility when he threw the javelin at him. Now we are here told how his enmity proceeded, and how David received the attacks of it. I. See how Saul expressed his malice against David. 1. He was afraid of him, v. 12. 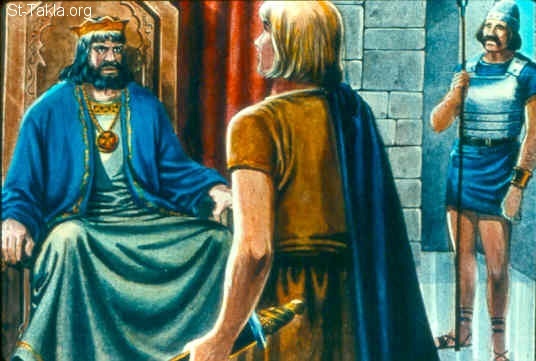 Perhaps he pretended to be afraid that David would do himself mischief, to force his way to the crown. Those that design ill against others are commonly willing to have it thought that others design ill against them. But David's withdrawal (v. 11) was a plain evidence that he was far from such a thought. However, he really stood in awe of him, as Herod feared John, Mark vi. 20. Saul was sensible that he had lost the favourable presence of God himself, and that David had it, and for this reason he feared him. Note, Those are truly great and to be reverenced that have God with them. The more wisely David behaved himself the more Saul feared him, v. 15, and again v. 29. Men think the way to be feared is to hector and threaten, which makes them feared by fools only, but despised by the wise and good; whereas the way to be both feared and loved, feared by those to whom we would wish to be a terror and loved by those to whom we would wish to be a delight, is to behave ourselves wisely. Wisdom makes the face to shine and commands respect. 2. He removed him from court, and gave him a regiment in the country, v. 13. He made him captain over 1000, that he might be from under his eye, because he hated the sight of him; and that he might not secure the interest of the courtiers. Yet herein he did impolitely; for it gave David an opportunity of ingratiating himself with the people, who therefore loved him (v. 16) because he went out and came in before them, that is, he presided in the business of his country, civil as well as military, and gave universal satisfaction. 3. He stirred him up to take all occasions of quarrelling with the Philistines and engaging them (v. 17), insinuating to him that hereby he would do good service to his prince (be thou valiant for me), and good service to his God (fight the Lord's battles), and a kindness to himself too, for hereby he would qualify himself for the honour he designed him, which was to marry his eldest daughter to him. This he had merited by killing Goliath, for it was promised by proclamation to him that should do that exploit (ch. xvii. 25); but David was so modest as not to demand it, and now, when Saul proposed it, it was with design of mischief to him, to make him venture upon hazardous attempts, saying in his heart, Let the hand of the Philistines be upon him, hoping that he would some time or other be the death of him; yet how could he expect this when he saw that God was with him? 4. He did what he could to provoke him to discontent and mutiny, by breaking his promise with him, and giving his daughter to another when the time came that she should have been given to him, v. 19. This was as great an affront as he could possibly put upon him, and touched him both in his honour and in his love. He therefore thought David's resentment of it would break out in some indecency or other, in word or deed, which might give him an advantage against him to take him off by the course of law. Thus evil men seek mischief. 5. When he was disappointed in his, he proffered him his other daughter (who it seems had a secret kindness for David, v. 20), but with this design, that she might be a snare to him, v. 21. (1.) Perhaps he hoped that she would, even after her marriage to David, take part with her father against her husband, and give him an opportunity of doing David an unkindness. However, (2.) The conditions of the marriage, he hoped, would be his destruction; for (so zealous will Saul seem against the Philistines) the conditions of the marriage must be that he killed 100 Philistines, and, as proofs that those he had slain were uncircumcised, he must bring in their foreskins cut off; this would be a just reproach upon the Philistines, who hated circumcision as it was an ordinance of God; and perhaps David, in doing this, would the more exasperate them against him, and make them seek to be revenged on him, which was the thing that Saul desired and designed, much more than to be avenged on the Philistines: For Saul thought to make David fall by the Philistines, v. 25. See here, [1.] What cheats bad men put upon themselves. Saul's conscience would not suffer him, except when the evil spirit was actually upon him, to aim at David's life himself, for even he could not but conceive a horror at the thought of murdering such an innocent and excellent person; but he thought that to expose him designedly to the Philistines had nothing bad in it (Let not my hand be upon him, but the hand of the Philistines), whereas that malicious design against him was as truly murder before God as if he had slain him with his own hands. [2.] What cheats they put upon the world. Saul pretended extraordinary kindness for David even when he aimed at his ruin, and was actually plotting it: Thou shalt be my son-in-law, says he (v. 21), notwithstanding he hated him implacably. Perhaps David refers to this when (Ps. lv. 21) he speaks of his enemy as one whose words were smoother than butter, but war was in his heart. 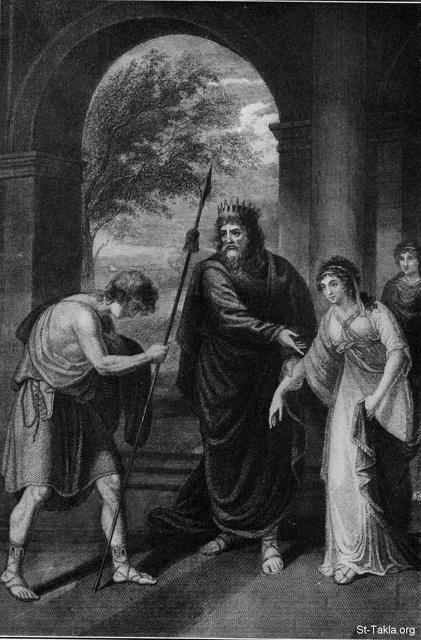 It is probable that Saul's employing his servants to persuade David to enter into a treaty of a match with his daughter Michal (v. 22) arose from an apprehension that either his having cheated him about his elder daughter (v. 19) or the hardness of the terms he intended now to propose would make him decline it. II. See how David conducted himself when the tide of Saul's displeasure ran thus high against him. 1. He behaved himself wisely in all his ways. He perceived Saul's jealousy of him, which made him very cautious and circumspect in every thing he said and did, and careful to give no offence. He did not complain of hard measure more make himself the head of a party, but managed all the affairs he was entrusted with as one that made it his business to do real service to his king and country, looking upon that to be the end of his preferment. And then the Lord was with him to give him success in all his undertakings. Though he procured Saul's ill-will by it, yet he obtained God's favour. Compare this with Ps. ci. 2, where it is David's promise, I will behave myself wisely; and that promise he here performed; and it is his prayer, O, when wilt thou come unto me? And that prayer God here answered: The Lord was with him. However blind fortune may seem to favour fools, God will own and bless those that behave themselves wisely. 2. When it was proposed to him to be son-in-law to the king he once and again received the proposal with all possible modesty and humility. When Saul proposed his elder daughter to him (v. 18) he said, Who am I, and what is my life? When the courtier proposed the younger, he took no notice of the affront Saul had put upon him in disposing of the elder from him, but continued in the same mind (v. 23): Seemeth it a light thing to you to be a king's son-in-law, seeing that I am a poor man and lightly esteemed? He knew Michal loved him, and yet did not offer to improve his interest in her affections for the gaining of her without her father's consent, but waited till it was proposed to him. And then see, (1.) How highly he speaks of the honour offered him: To be son-in-law to the king. Though his king was but an upstart, in his original as mean as himself, in his management no better than he should be, yet, being a crowned head, he speaks of him and the royal family with all due respect. Note, Religion is so far from teaching us to be rude and unmannerly that it does not allow us to be so. We must render honour to whom honour is due. (2.) How humbly he speaks of himself: Who am I? This did not proceed from a mean, abject, sneaking spirit, for when there was occasion he made it appear that he had as high a sense of honour as most men; nor was it from his jealousy of Saul (though he had reason enough to fear a snake under the green grass), but from him true and deep humility: Who am I, a poor man, and lightly esteemed? David had as much reason as any man to value himself, and you can find more about that here on st-takla.org on other commentaries and dictionary entries. He was of an ancient and honourable family of Judah, a comely person, a great statesman and soldier; his achievements were great, for he had won Goliath's head and Michal's heart. He knew himself destined by the divine counsels to the throne of Israel, and yet, Whom am I, and what is my life? Note, It well becomes us, however God has advanced us, always to have low thoughts of ourselves. He that humbleth himself shall be exalted. And, if David thus magnified the honour of being son-in-law to the king, how should we magnify the honour of being sons (not in law, but in gospel) to the King of kings! Behold what manner of love the Father has bestowed upon us! Who are we that we should be thus dignified? 3. When the slaying of 100 Philistines was made the condition of David's marrying Saul's daughter he readily closed with it (v. 26): It pleased David well to be the king's son-in-law upon those terms; and, before the time given him for the action had expired, he doubled the demand, and slew 200, v. 27. He would not seem to suspect that Saul designed his hurt by it (though he had reason enough), but would rather act as if Saul had meant to consult his honour, and therefore cheerfully undertook it, as became a brave soldier and a true lover, though we may suppose it uneasy to Michal. David hereby discovered likewise, (1.) A great confidence in the divine protection. He knew God was with him, and therefore, whatever Saul hoped, David did not fear falling by the Philistines, though he must needs expose himself much by such an undertaking as this. (2.) A great zeal for the good of his country, which he would not decline any occasion of doing service to, though with the hazard of his life. (3.) A right notion of honour, which consists not so much in being preferred as in deserving to be so. 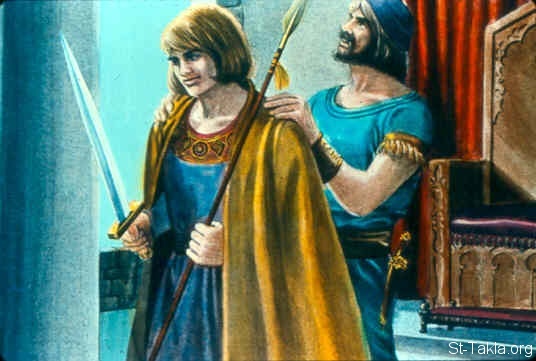 David was then pleased with the thoughts of being the king's son-in-law when he found the honour set at this high price, being more solicitous how to merit it than how to obtain it; nor could he wear it with satisfaction till he had won it. 4. Even after he was married he continued his good services to Israel. When the princes of the Philistines began to move towards another war David was ready to oppose them, and behaved himself more wisely than all the servants of Saul, v. 30. The law dispensed with men from going to war the first year after they were married (Deut. xxiv. 5), but David loved his country too well to make use of that dispensation. Many that have shown themselves forward to serve the public when they have been in pursuit of preferment have declined it when they have gained their point; but David acted from more generous principles. III. Observe how God brought good to David out of Saul's project against him. 1. Saul gave him his daughter to be a snare to him, but in this respect that marriage was a kindness to him, that his being Saul's son-in-law made his succeeding him much the less invidious, especially when so many of his sons were slain with him, ch. xxxi. 2. 2. 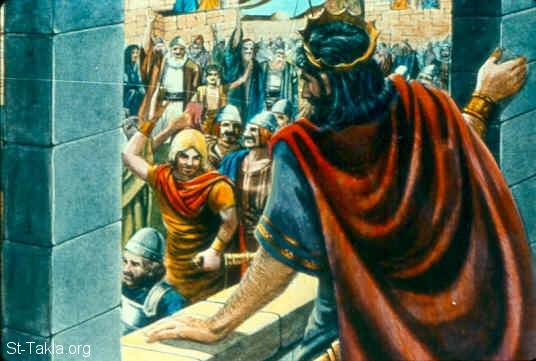 Saul thought, by putting him upon dangerous services, to have him taken off, but that very thing confirmed his interest in the people; for the more he did against the Philistines the better they loved him, so that his name was much set by (v. 30), which would make his coming to the crown the more easy. Thus God makes even the wrath of man to praise him and serves his designs of kindness to his own people by it.